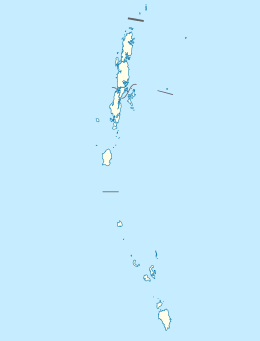 Baratang Island is an island of the Andaman Islands. It belongs to the North and Middle Andaman administrative district, part of the Indian union territory of Andaman and Nicobar Islands. The island lies 150 km (93 miles) north of Port Blair. Ranchiwalas Island is another name for Baratang Island. Towards the close of the nineteenth century, the city of Ranchi experienced political upheaval. Many locals sought refuge by converting to Christianity with the help of the missionaries there. The British, realizing the future prospects of the forests of Andaman and Nicobar islands, sent the converts to Baratang Island to cultivate crops. The laborers from Ranchi settled there and made new lives for themselves. A lighthouse was commissioned in 1985 at the eastern entrance to the Andaman strait. The island belongs to the Great Andaman Chain, and with an area of 242.6 square kilometres (93.7 sq mi) it is one of the main islands of the group, a closely set archipelago in the Bay of Bengal, adjoining the Andaman Sea. Middle Andaman is to its north, and South Andaman to the south. Beaches, mangrove creeks, limestone caves, and mud volcanoes are some of the physical features. The islands of Ritchie's Archipelago lie 14 kilometres (8.7 mi) to the east. Port Blair, the capital of the Indian Union Territory of Andaman and Nicobar Islands, is located approximately 45 kilometres (28 mi) from the southern tip of Baratang. Baratang contains the only known examples of mud volcanoes in India. These mud volcanoes have erupted sporadically, with recent eruptions in 2005 believed to have been associated with the 2004 Indian Ocean earthquake. The previous major eruption recorded was on 18 February 2003. The locals call this mud volcano jalki. There are other volcanoes in the area, the Barren Island volcano which is the only active volcano in South Asia, and the Narcondum volcano which is considered to be a potentially active volcano. Politically, Baratang Island is part of Rangat Taluk. The island is dissected by the Andaman Trunk Road to Rangat and Mayabunder.There are 2 ferry crosses: "Bamboo Trikery" Jetty and "Nilambur" Jetty. The Veer Savarkar International Airport in the city of Port Blair is the nearest airport located approximately 104 km away from the isle. 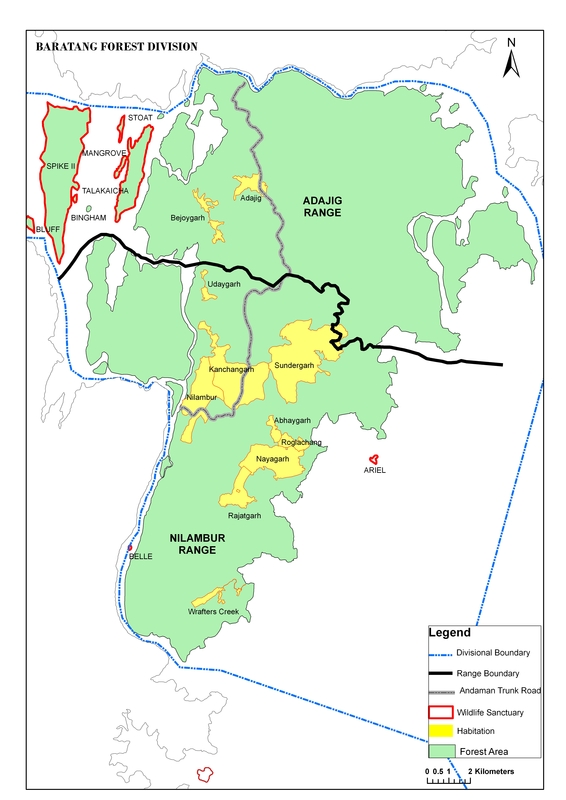 There are a twelve villages on Baratang, most noted are Adazig, Sunderghar, Nayaghar and Nilambur(HQ). According to the 2011 census of India, the Island has 5691 inhabitants. The effective literacy rate (i.e. the literacy rate of population excluding children aged 6 and below) is 100%. This island is inhabited mainly by the local Jarawa tribes. Baratang has very few private accommodations. Panchayat, Forest and PWD guest houses are also available. Visitors should book well in advance for a confirmed reservation.Its a budding destination, Most tourist visit on a same day trip to this Island due to lack of proper accommodation. The major attractions are the limestone caves, the Mud volcano, Parrot Island, and Baludera Beach. The Jarawas, also allure many tourists each year. While driving through the dense forests on the Andaman Trunk Road, it is possible to encounter a Jarawa. Until 1998 the Jarawas managed to keep their distance from the outside world for thousands of years. But a highway running through their homeland which draws several hundred tourists each year. ^ "Islandwise Area and Population - 2011 Census" (PDF). Government of Andaman. ^ "STD Codes of Andaman and Nicobar". allcodesindia.in. Retrieved 23 September 2016. ^ "Village Code Directory: Andaman & Nicobar Islands" (PDF). Census of India. Retrieved 16 January 2011. ^ Paty, Chittarangjan Kumar (2007). Forest, Government, and Tribe. New Delhi: Concept Publishing Company. p. 107. ISBN 81-8069-406-2. ^ "Government of India, Directorate General of Lighthouses and Lightships". www.dgll.nic.in. Retrieved 18 October 2016. ^ "Official Website of Andaman & Nicobar Tourism || A & N Administration || India". www.andamans.gov.in. Retrieved 3 October 2017. ^ "DEMOGRAPHIC – A&N ISLANDS" (PDF). andssw1.and.nic.in. Retrieved 23 September 2016. ^ "Official Website of Andaman & Nicobar Tourism || A & N Administration || India". www.andamans.gov.in. Retrieved 10 October 2017. ^ a b "District Census Handbook - Andaman & Nicobar Islands" (PDF). 2011 Census of India. Directorate of Census Operations, Andaman & Nicobar Islands. Archived from the original (PDF) on 1 August 2015. Retrieved 2015-07-21. ^ Jebaraj, Priscilla (17 June 2010). "Human safaris threaten Jarawas in the Andamans". The Hindu. ISSN 0971-751X. Retrieved 10 October 2017. Wikimedia Commons has media related to Baratang Island.